Freshly roasted, ethically sourced coffee & coffee subscriptions tailored for you. Proper Coffee. Morning, Noon or Night. Our freshly roasted coffees are ethically sourced and carefully crafted for your enjoyment around the clock. So if your mornings need a kick to get started or your days a boost to keep going then don't worry, we've got you covered. And at the end of the day, wouldn't you just love a coffee that's a little more relaxing but with the same great taste? Got that covered too. 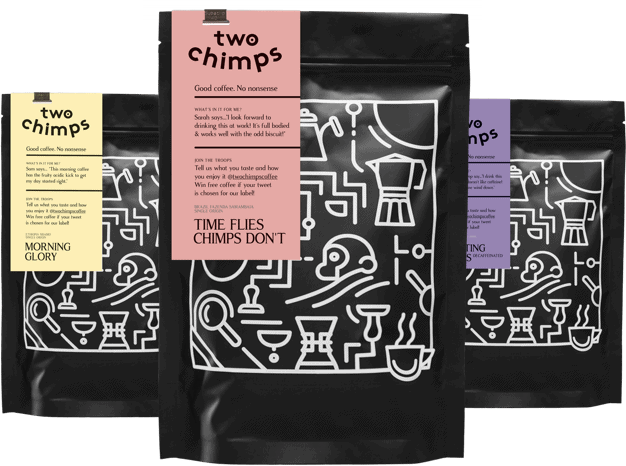 At Two Chimps, we're here for you every step of the day (and night) with our hand roasted, small batch speciality coffees that are all full of character and bursting with flavour. By never 'over roasting' our coffee, we avoid bitter and burnt tastes. This leaves room for naturally sweet and smooth flavours to shine instead. We roast and post daily in whole bean or your choice of grind size, so why not grab a bag today or start a coffee subscription so you never run out of Two Chimps coffee again! And don't forget, all of our coffees come with free 1st class delivery so what are you waiting for? Awesome coffee is just a few clicks away. Buy coffee in our shop or scroll down to start your subscription today. Use our coffee finder to tailor the perfect coffee subscription for you. Just answer four questions and the coffee finder will do the rest.